Hello all! I have a pretty-in-pink card to share with you today using the gorgeous Lace Background, Stitched Rectangle Frames, Flutter of Butterflies - Solid, Flutter of Butterlies - Lace, and Simply Fabulous Sayings. I didn't want to cover up too much of the gorgeous background, so a simple strip and accent is all it took for this one. :) A little foam tape added *just* the right amount of dimension. 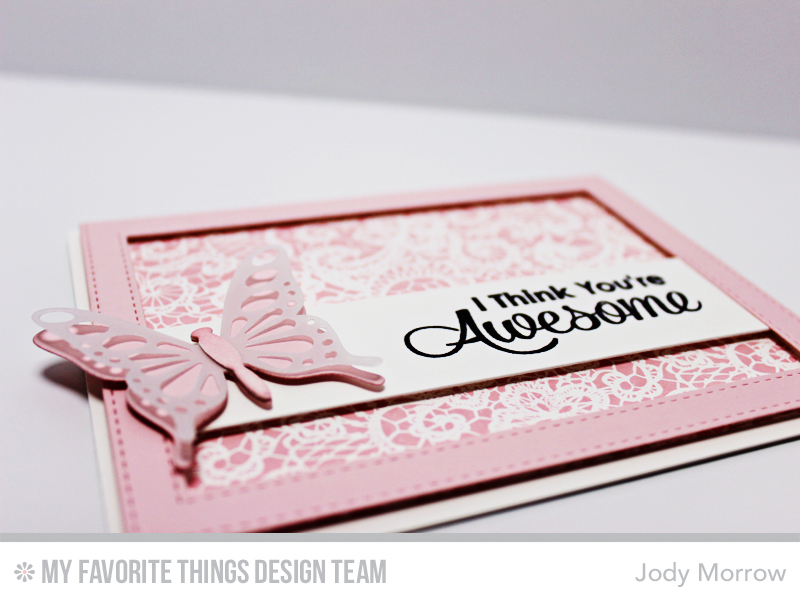 Beautiful card, Jody! Love the framing over the lace background - and of course "popping it up" adds that dimension! What a beautiful card, Jody! Perfect use of texture and dimension and SO pretty! !